Alexanderplatz is a large public square and transport hub in the Mitte (city centre) district of Berlin, near the river Spree and the Berliner Dom. 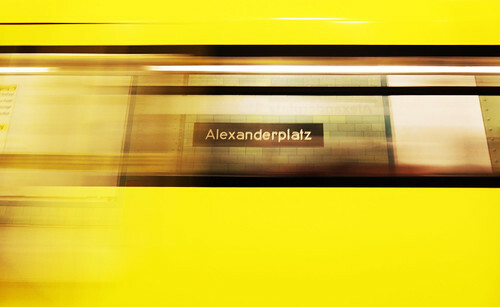 Berliners often call it simply Alex, referring to a larger neighborhood stretching from Mollstraße in the northeast to Spandauer Straße and the City Hall in the southwest. Originally a cattle market, it was named in honor of a visit of the Russian Emperor Alexander I to Berlin on 25 October 1805. It gained a prominent role in the late 19th century with the construction of the station of the same name and a nearby public market, becoming a major commercial center. Its heyday was in the 1920s, when together with Potsdamer Platz it was at the heart of Berlin’s nightlife, inspiring the 1929 novel Berlin Alexanderplatz (see 1920s Berlin) and the two films based thereon, Piel Jutzi’s 1931 film and Rainer Werner Fassbinder’s 15 1/2 hour second adaptation, released in 1980. The Alexanderplatz has been subject to redevelopment several times in its history, most recently during the 1960s, when it was enlarged as part of the German Democratic Republic’s redevelopment of the city center. It is surrounded by several notable structures including the Fernsehturm (TV Tower), the second tallest structure in Europe. Because of its high profile, many newcomers to Berlin mistake the nickname Alex and apply it to the Fernsehturm instead. The Alex also accommodates the Park Inn Berlin and the World Time Clock, a continually rotating installation that shows the time throughout the globe, the 1932 Alexanderhaus and Berolinahaus by Peter Behrens, and Hermann Henselmann’s Haus des Lehrers. Following German reunification the Alexanderplatz has undergone a gradual process of change with many of the surrounding buildings being renovated. Despite the construction of a tram line it has retained its socialist character, including the much-graffitied Fountain of Friendship between Peoples (Brunnen der Völkerfreundschaft). In 1993 plans for a major redevelopment including the construction of several skyscrapers were published, but due to a lack of demand it is unlikely these will be constructed. However, beginning with the reconstruction of the department store Kaufhof in 2004, and the biggest underground railway station of Berlin, some buildings will be redesigned and new structures built on the square’s south-eastern side. The Alexa shopping mall, with approximately 180 stores opened in Alexanderplatz during 2007 and a large Saturn electronic store is currently being built in Alexanderplatz due to open in 2009. Many historic buildings are located in the area around Alexanderplatz. The traditional seat of city government, the Rotes Rathaus, or Red City Hall, is located nearby, as is the former East German parliament building, the Palast der Republik, demolition of which began in February 2006 and is expected to be completed sometime in 2009.